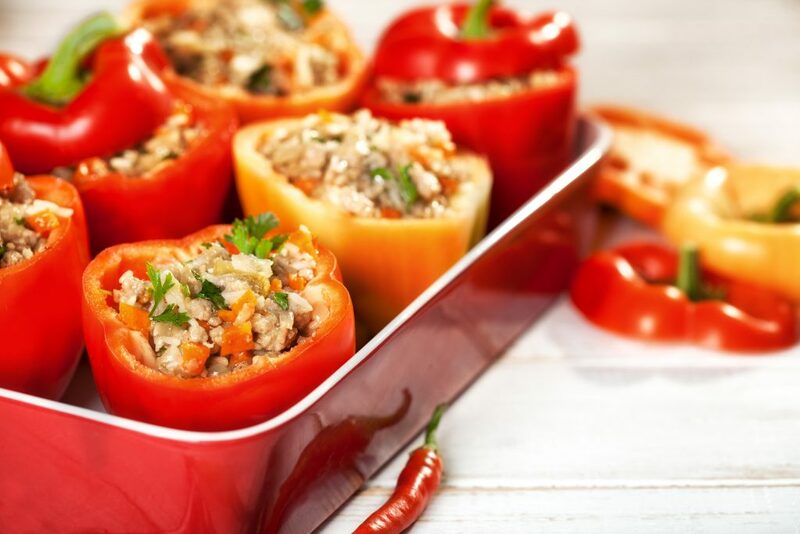 Sense of Purpose > Topics > Nutrition > How To Make Stuffed Peppers? This article is on how to make stuffed peppers. This is a great basic recipe that is easily altered to taste. For instance, substitute the cumin for Italian seasoning and some Parmesan, or try substitute the rice for cauliflower to reduce your carbohydrate intake. Alternatively, ground turkey is lean low-fat substitute for ground beef. Furthermore, tofu is a great way to make these stuffed peppers 100% vegetarian. The recipe requires 10 minutes of active preparation and 30 minutes of baking time. Thus, the recipe is ready in 40 minutes. If you are cooking with tofu, crumble the tofu into the pan, breaking it up with your fingers. If you are cooking with ground turkey or ground beef use a wooden spoon crumble the meat. Continue cooking for 2 minutes or until the thoroughly cooked. How to make stuffed peppers? This is an easy and deliciously nutritious meal that the entire family will love!